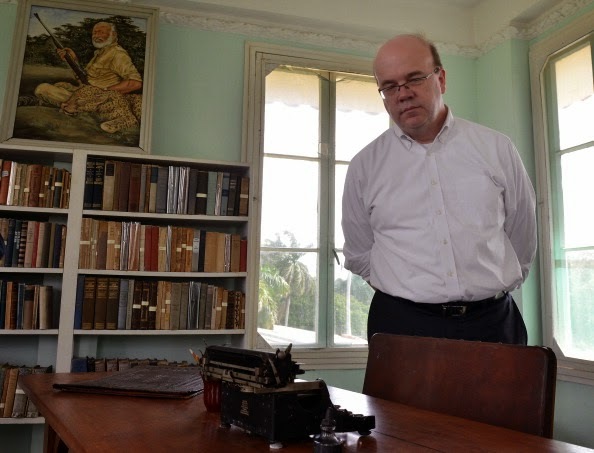 US congressman Jim McGovern, looks at a Corona 3 portable typewriter during a visit to Ernest Hemingway's former home near Havana, on March 17. Presumably it is the same Corona 3 that was given to Hemingway by his first wife, Hadley Richardson, on July 21, 1921, Hemingway's 22nd birthday. 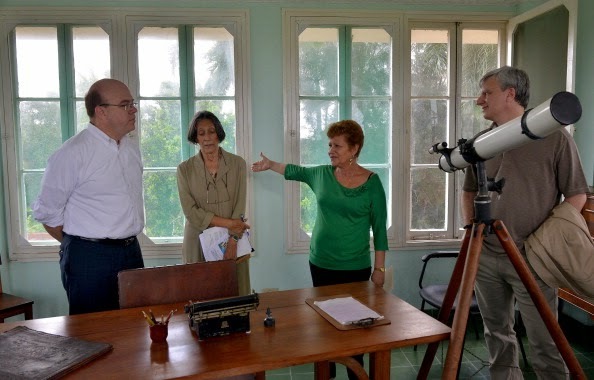 SAN FRANCISCO DE PAULA, Cuba (AP) — US Congressman Jim McGovern visited Ernest Hemingway's former home outside Havana on March 17 to celebrate a joint US-Cuban effort to preserve and digitise the Nobel Prize-winning author's personal effects and writings. Cuban curators gave the Massachusetts Democrat and a visiting US delegation a rare guided tour inside the modest but graceful Finca Vigia, a hilltop estate that is surrounded by lush tropical fruit trees and boasts panoramic views of the Havana skyline. Cuba, where Hemingway lived from 1939 to 1960 and wrote much of The Old Man and the Sea and other works, claims the man known affectionately as "Papa" as a favourite son. McGovern said, "Hemingway has always brought people together. He transcends politics, and one of the points that I want to make today is that if Cubans and Americans can come together in a constructive way and do this, to help preserve a house and all its contents, then there's no limit to what we can do if we work together." Scholars from both countries have been working together for more than a decade to preserve the home and its trove of documents, everything from bar bills and bullfighting tickets to personal notes and recipes. Last month, thousands of digital scans of Hemingway's Cuban papers were made available at the John F. Kennedy Presidential Library and Museum in Boston. The library is home to the world's biggest Hemingway collection, including 90 per cent of his manuscript material. The collection in Cuba includes items such as the insurance for Hemingway's 1941 Plymouth station wagon, his local firearms license and the telegram notifying him that he had won the 1954 Nobel Prize for Literature. "We are working to preserve the Hemingway collection for our children's children, and for our grandchildren's grandchildren," said Ada Rosa Alfonso, director of Finca Vigia. The writer's fourth and last wife, Mary Welsh Hemingway, donated the estate in San Francisco de Paula, about a half-hour drive outside of Havana, to the Cuban government in 1961. This was shortly after Hemingway committed suicide in Ketchum, Idaho. In recent years the house was in danger of collapse, prompting US and Cuban scholars to launch a restoration project. Historians say they have preserved Finca Vigia more or less just as "Papa" left it. At least a dozen animal heads are mounted on the walls, a tribute to Hemingway's enthusiasm for trophy hunting. On a living room table sit the same half-full liquor bottles that were there more than five decades ago. Still legible in the bathroom are scribbled notes on a wall where Hemingway kept track of his weight, blood pressure and pulse every day. "Everyone talks about the documents," said Gladys Rodriguez, former director of Finca Vigia and a leading Cuban expert on Hemingway. "But if we keep in mind that Hemingway wrote on the very walls, the home itself becomes a tremendous document ... It is the testimony of everything Hemingway did." McGovern listens to the director of Hemingway's Museum, Ada Rosa Alfonso, second from right.